Baumer TXF digital cameras offer unparalleled flexibility and versatility. 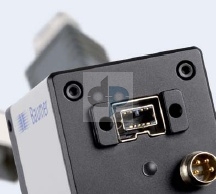 Baumer FCAM imaging is the perfect platform for installations using multiple cameras . Ultra-fast 80 Mbyte/second transfer rate allows multiple cameras to operate flawlessly. Rounding out the features of the TXF Series are high-quality images (8/12 bit) and monochromatic or color outputs with VGA ranging to 5 megapixels.